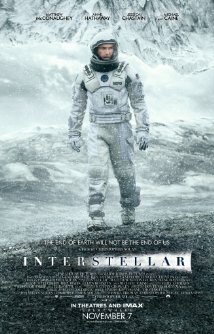 Some films arrive in the cinema burdened by the weight of unreasonable expectation and Interstellar is one such film. Probably the most anticipated release since Prometheus (and look what happened with that! ), if we are to believe what we’re told, this film is destined to save the film industry itself because what the world needs now is a major blockbuster and this just might be it. The film takes on weighty themes like the demise of mankind, the exploration of space and some fairly ‘out there’ theories about black holes and the fifth dimension. If much of it feels like a homage to Kubrick’s 2001, that’s no bad thing. The good news is, that though not perfect, Christopher Nolan’s three hour epic manages to hold a viewer’s attention throughout and in two key set pieces racks up levels of almost unbearable suspense. It’s to the film’s credit, that it makes some fairly unlikely events seem believable, but much of the ‘science’ here is so mind-blowingly complicated, that characters often have to resort to sketching diagrams to ensure that the audience understands it better – and there’s a final M. Night Shymalan-style twist that will either have you starry-eyed with wonder or shouting ‘no way!’ at the screen. Whether Interstellar can save the film industry is debatable. What is for sure is that Nolan hasn’t lost his Midas touch when it comes to creating awe-inspiring cinema. The father-daughter relationship at the heart of this tale is a powerful hook and the cinematography and special effects sequences are often breath-taking. A palpable hit, methinks.